The St John ARES®, Rescue and Park Service band together to keep emergency repeaters on the air. Talk about an “Oh, no” moment. 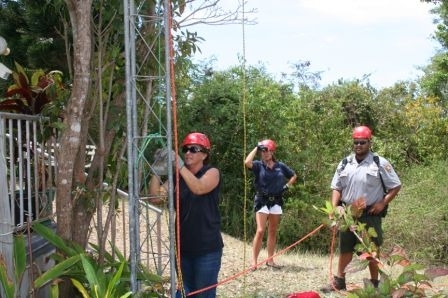 Hams on St John Island in the US Virgin Islands (USVI) got word that the Mamey Peak radio tower — home to repeaters serving a volunteer emergency rescue group and the Virgin Islands National Park Service — was being shut down. Tower eviction notices arrived. St John Rescue and the Virgin Islands National Park Service were up against a 60 day deadline to get the repeaters off the site. Why was this such a big deal? Hundreds of times each year, residents and visitors on St John are aided by St John Rescue volunteers. Members assist police, fire and emergency medical services on calls ranging from traffic accidents to medical emergencies. Visitors and residents depend on the National Park Service for assistance within park land and park employees routinely partner with Rescue. Reliable communications are critical. With the help and cooperation of Virgin Islands National Park Superintendent Mark Hardgrove, a new physical location for a tower was found on park land atop Lizard Hill but relocation challenges lay ahead. The Lizard Hill site was already home to a 20 foot Rohn 25G tower with VHF antenna and feed but current needs called for something more substantial. The project would require advanced technical expertise. Up stepped George Cline, KP2G, of ARES and a long-time communications officer for St John Rescue — a volunteer who has been instrumental in much of the island’s emergency communications infrastructure. Hardgrove asked Cline to serve as volunteer operations director for the project, which would include installing additional sections of tower to raise it to 68 feet and relocating the repeaters. One unique thing about a small island is that volunteers in one group often serve in another group. As members of both ARES and St John Rescue, Cline; ARES President Paul Jordan, NP2JF, and Rescue Chief Operations Officer Gilly Grimes, NP2OW, knew the importance of a seamless move as did Park Ranger and Rescue member Dave Horner. Also stepping up to help were Assistant Rescue Chief and National Park lifeguard Terry Rogaczewski, Park Ranger and Rescue member Antonio Robinson and Rescue members Jessica Severance, Preston Pollock, Dylan Baird and Andi Vacharat. With willing volunteers from ARES, Rescue and the National Park, the group prepared for this sizable task. Tower supports were needed. Cline donated all of the pre-made galvanized steel cables, the tower guying hardware, the hardware for the ground end of the guys, insulators, turnbuckles and other items. By providing his technical support and labor at no cost, along with needed supplies, Cline saved Rescue and the Virgin Islands National Park Service quite a bit of money, as did the many other volunteers who helped make the move a success. Gilly Grimes stepped up to do the tower climbing — not an easy job in the first place. Gusty winds slowed the work a bit but the project moved forward. 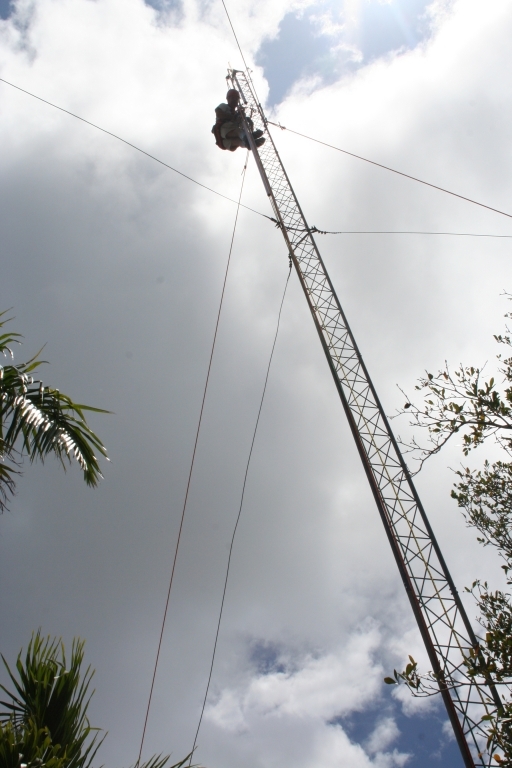 The long-time Mamey Peak repeater site had provided radio coverage for the north, northeast and northwest sections of St John, including the much-used North Shore beaches. To avoid as little gap in service as possible, it was critical to get the tower up and stabilized with steel guy wires so that antennas could be mounted before repeaters were put in place. Time from shutdown, moving, installation and bringing the repeaters up on frequency at the new location was less than 2 hours; the plan and related execution were successful. With donated time and materials, the money output to build the new tower and move the repeaters was small; continuing radio service to support Park and Rescue public safety activities is priceless. Photos courtesy of St John Rescue. Phyllis, NP2MZ, an ARRL member, was first licensed in 2005 after moving to St John, USVI. She is active in several nets and local amateur clubs, serves as the ARRL Virgin Islands Section Public Information Coordinator and occasionally tries to work the world from her home in Coral Bay. She is a federally licensed wild bird rehabilitator, works part time at a local mail center and helps out every now and then at the family business — Crabby’s Watersports. Friends from the local Amateur Radio club stepped up to run the business earlier this year when her husband suffered a ruptured appendix. Small island, great ham friends. 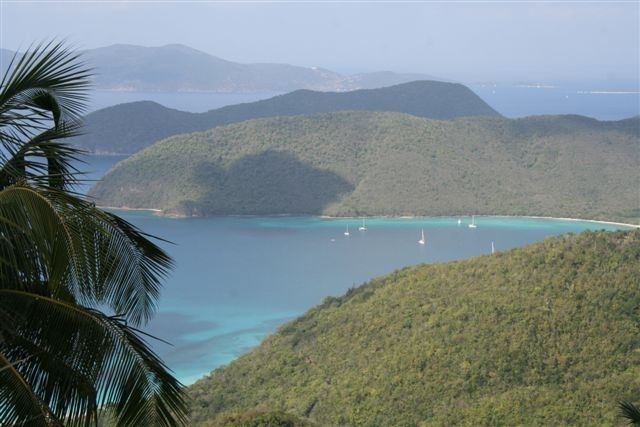 Phyllis can be reached c/o Crabby’s Watersports, 16136 Spring Garden, St John, VI 00830-9566, np2mz@arrl.net.